Participants will network with one another, receive advocacy training, and learn how to leverage their networks to engage their communities and policymakers in taking action. The conference will culminate in a lobby day on Capitol Hill. 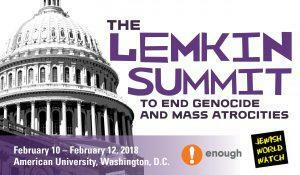 The Lemkin Summit is named in honor of Raphael Lemkin, a Polish-Jewish lawyer who was an ardent activist and tireless defender of human rights. Lemkin coined the term “genocide” in 1944, lobbied the UN for genocide to be added to international law, and participated in the drafting of the Convention on the Prevention and Punishment of the Crime of Genocide. * Participants are expected to attend the full conference. Cost: Registration Fee covers training, materials, and most meals; accommodations are not included. Travel/Accommodations: A limited amount of travel stipends will be available to students coming from outside D.C. to subsidize their travel costs. To apply for a travel stipend, please indicate your interest in the application below. Accepted applicants will be notified by early December.